Visitation will be 5 to 7 p.m., Thursday, January 24, 2019 at Behrens-Wilson Funeral Home. Funeral services will be 2:00 p.m., Friday, January 25th at the Elm Springs Church, with Pastor Paul Wilson officiating. Interment will follow at the Elm Springs Cemetery. Coffee and desserts will be served following the interment. Behrens-Wilson Funeral Home is in care of the arrangements and condolences may be conveyed to the family through their website. 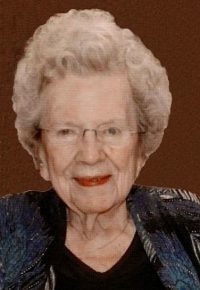 Judith Olsen passed away January 19, 2019 at the age of 101. She was born in Redfield, SD on February 7, 1917 to Bertha and John Brustol. They later moved to the Elm Springs area. Judith married Martin Olsen on January 1, 1947 in Rapid City and then had a fun honeymoon trip to Florida. They farmed and ranched at Elm Springs until his death in 1989. Judith always had time to invite her neighbors in for a cup of coffee and a cookie. She was very active in the Elm Springs community, giving her time and talents to the Elm Springs Ranchers 4-H Club, the WTL Club, the Cowbelles and the Red Hat Club. For many years she played piano at the Elm Springs Community Church for Memorial Day services and funerals. She taught several people how to knit and made hundreds of Christmas stockings for friends and relatives. Judith moved to Westhills Village in Rapid City, almost 30 years ago. She loved playing bingo and hosting the weekly Skipbo game for her neighbors. Her Norweigian heritage was a big part of her life. She loved getting letters from cousins in Norway, eating lutefisk and was always happy when someone would stop by with lefsa and krumkakes. She was very generous and had a way of making everyone feel special. She often wondered why the Lord wanted her to live so long, it was probably to teach others how to be kind, gracious, thankful and loving. She was preceded in death by her husband Martin, her parents, sister Christine Ferguson, brothers Martin and Carl Brustol and a niece, Barbara Perry. She is survived by nieces Judy (Jose) Vasquez, Virginia (Paul) Wilson, Nancy (Larry) Simonson, Walborg (David) Robbins, Karen (Howard) Kunstle, Roberta Olsen and nephews Clyde (Rhonda) Brustol, John (Evelyn) Brustol, Kermit Olsen, Kenny Olsen, Ray Olsen, special friend Debi White and many more relatives and friends.